Gus Hall (born Arvo Kustaa Halberg; October 8, 1910 – October 13, 2000) was a leader and chairman of the Communist Party USA (CPUSA) and its four-time U.S. presidential candidate. As a labor leader, Hall was closely associated with the so-called "Little Steel" Strike of 1937, an effort to unionize the nation's smaller, regional steel manufacturers. During the Second Red Scare, Hall was indicted under the Smith Act and was sentenced to eight years in prison. After his release, Hall led the CPUSA for over 40 years, often taking an orthodox Marxist–Leninist stance. Open battle between striking teamsters armed with pipes and the police in the streets of Minneapolis, June 1934. Hall was born Arvo Kustaa Halberg in 1910 in Cherry, a rural community on Northern Minnesota's Mesabi Iron Range. He was the son of Matt (Matti) and Susan (Susanna) Halberg. Hall's parents were Finnish immigrants from the Lapua region, and were politically radical: they were involved in the Industrial Workers of the World (IWW) and were early members of the Communist Party USA (CPUSA) in 1919. The Mesabi Range was one of the most important immigration settlements for Finns, who were often active in labor militancy and political activism. Hall's home language was Finnish, and he conversed with his nine siblings in that language for the rest of his life. He did not know political terminology in Finnish and used mostly English when meeting with visiting Finnish Communists. Hall grew up in a Communist home and was involved early on in politics. According to Hall, after his father was banned from working in the mines for joining an IWW strike, the family grew up in near starvation in a log cabin built by Halberg. At 15, to support the impoverished ten-child family, Hall left school and went to work in the North Woods lumber camps, mines and railroads. Two years later in 1927, he was recruited to the CPUSA by his father. Hall became an organizer for the Young Communist League (YCL) in the upper Midwest. In 1931, an apprenticeship in the YCL qualified Hall to travel to the Soviet Union to study for two years at the International Lenin School in Moscow. After his studies, Hall moved to Minneapolis to further the YCL activities there. He was involved in hunger marches, demonstrations on behalf of farmers, and various strikes during the Great Depression. In 1934, Hall was jailed for six months for taking part in the Minneapolis Teamster's Strike (led by Trotskyist Farrell Dobbs). After serving his sentence, Hall was blacklisted and was unable to find work under his original name. He changed his name to Gus Hall, derived from Kustaa (Gustav) Halberg. The change was confirmed in court in 1935. In late 1934, Hall went to Ohio's Mahoning Valley. Following the call for organizing in the steel industry, Hall was among a handful hired at a steel mill in Youngstown, Ohio. During 1935–1936, he was involved in the Congress of Industrial Organizations (CIO) and was a founding organizer of the Steel Workers Organizing Committee (SWOC), which was set up by the CIO. Hall stated that he and others persuaded John L. Lewis, who was one of the founders of CIO, that steel could be organized. In Youngstown, Hall met Elizabeth Mary Turner (1909–2003), a woman of Hungarian background. They were married in 1935. Elizabeth was a leader in her own right, among the first women steelworkers and a secretary of SWOC. They had two children, Barbara (Conway) (born 1938) and Arvo (born 1947). Hall was a leader of the 1937 "Little Steel" strike, so called because it was directed against Republic Steel, Bethlehem Steel and the Youngstown Sheet and Tube Company, as opposed to the industry giant U.S. Steel. It had previously entered into a contract with SWOC without a strike. The strike was ultimately unsuccessful, and marred by the deaths of workers at Republic plants in Chicago and Youngstown. Hall was arrested for allegedly transporting bomb-making materials intended for Republic's plant in Warren, Ohio. He pleaded guilty to a misdemeanor and was fined $500. SWOC became the United Steelworkers of America (USWA) in 1942. Philip Murray, USWA founding president, once commented that Hall's leadership of the strike in Warren and Youngstown was a model of effective grassroots organizing. After the 1937 strike, Hall focused on party activities instead of union work, and became the leader of the Communist Party USA (CPUSA) in Youngstown in 1937. His responsibilities in the party grew rapidly, and in 1939 he became the CPUSA leader for the city of Cleveland. Hall ran on the CPUSA ticket for Youngstown councilman and also for governor of Ohio, but received few votes. In 1940 Hall was convicted of fraud and forgery in an election scandal and spent 90 days in jail. Hall volunteered for the U.S. Navy when World War II broke out, serving as a machinist in Guam. During the first years of the war in Europe, the CPUSA held an isolationist stance, as the Soviet Union and Nazi Germany were cooperating based on the Molotov-Ribbentrop pact. When Hitler broke the treaty by invading the USSR in June 1941, the CPUSA began to officially support the war effort. During his naval service, Hall was elected in absence to the National Committee of the CPUSA. He was honorably discharged from the Navy on March 6, 1946. Seen as a Moscow loyalist, Hall's reputation in the party rose after the war. In 1946 he was elected to the national executive board of the party under the new general secretary, Eugene Dennis, a pro-Soviet Marxist–Leninist, who had replaced Earl Browder after the latter's expulsion from the party. Now a major American communist leader in the post-war era, Hall caught the attention of US officials. On July 22, 1948, Hall and 11 other Communist Party leaders were indicted under the Alien Registration Act, popularly called the Smith act, on charges of "conspiracy to teach and advocate the overthrow of the U.S. government by force and violence", although his conviction was based entirely on Hall's advocacy of Marxist thought. Hall's initial prison sentence lasted for five years. Released on bail, Hall rose to the secretariat of the CPUSA. When the Supreme Court upheld the Smith Act (June 4, 1951), Hall and three other men skipped bail and went underground. 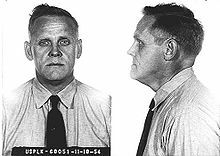 Hall's attempt to flee to Moscow failed when he was picked up in Mexico City on October 8, 1951. He was sentenced to three more years and eventually served over five and a half years in Leavenworth Federal Penitentiary. In prison he distributed party leaflets and lifted weights. He was located in a cell adjacent to that of George Kelly, a notorious gangster of the prohibition era. The U.S. Supreme Court later reversed some convictions under the Smith Act as unconstitutional. In the early 1960s, Hall was in danger of facing yet another indictment, this time under the Internal Security Act of 1950, known as the McCarran Act, but the Supreme Court found the Act partly unconstitutional, and the government abandoned its charges. The act required "Communist action" organizations to register with the government, it excluded party members from applying for United States passports or holding government jobs. Because of the Act, Hall's driver's license was revoked by the State of New York. After his release, Hall continued his activities. He began to travel around the United States, ostensibly on vacation but gathering support to replace Dennis as the general secretary. He accused the general secretary Dennis of cowardice for not going underground as ordered in 1951 and also claimed Dennis had used funds reserved for the underground for his own purposes. Hall's rise to the position of general secretary was generally unexpected by the American Communist circles (the post was expected to go to either Henry Winston or Gil Green, both important figures in the YCL) although Hall had held the office of acting general secretary briefly in the early 1950s during Dennis's arrest. In 1959, Hall was elected CPUSA general secretary and afterward received the Order of Lenin. The McCarthy Cold War era had taken a heavy toll on the Communist Party USA, as many American members were called to testify to Congressional committees. In addition, due to the Soviet invasion of Hungary in 1956, many members became disenchanted and left the party. They were also moved by the Soviet leader Nikita Khrushchev's dismissal of Stalinism. In the United States, the rise of the New Left and the Warsaw Pact invasion of Czechoslovakia in 1968 created hostility between leftists and the CPUSA, marginalizing it. Hall, along with other Party leaders who remained, sought to rebuild the party. He led the struggle to reclaim the legality of the Communist Party and addressed tens of thousands in Oregon, Washington, and California. Envisioning a democratization of the American Communist movement, Hall spoke of a "broad people's political movement" and tried to ally his party with radical campus groups, the anti-Vietnam War movement, organizations active in the Civil Rights Movement, and the new rank-and-file trade union movements in an effort to build the CPUSA among the young "baby boomer" generation of activists. Ultimately, Hall failed to forge a lasting alliance with the New Left. Hall spoke regularly on campuses and talk shows as an advocate for socialism in the United States. He argued for socialism in the United States to be built on the traditions of U.S.-style democracy rooted in the United States Bill of Rights. He would often say Americans didn't accept the Constitution without a Bill of Rights and wouldn't accept socialism without a Bill of Rights. He professed deep confidence in the democratic traditions of the American people. He remained a prolific writer on current events, producing a great number of articles and pamphlets, of which many were published in the magazine Political Affairs. During the 1960s and 1970s, Hall also made frequent appearances on Soviet television, always supporting the position of the Soviet Communist Party and the Leonid Brezhnev regime. Hall guided the CPUSA in accordance with the party line of the Communist Party of the Soviet Union (CPSU), rejecting any liberalization efforts such as Eurocommunism. He also dismissed the radical new revolutionary movements that criticized the official Soviet party line of "Peaceful coexistence" and called for a world revolution. After the Sino-Soviet split, Maoism likewise was condemned, and all Maoist sympathizers were expelled from the CPUSA in the early 1960s. Hall had a reputation of being one of the most convinced supporters of the actions and interests of the Soviet Union outside the USSR's political sphere of influence. From 1959 onward, Hall spent some time in Moscow each year and was one of the most widely known American politicians in the USSR, where he was received by high-level Soviet politicians such as Leonid Brezhnev. Hall defended the Soviet invasions of Czechoslovakia and Afghanistan, and supported the Stalinist principle of "Socialism in One Country". In the early 1980s, Hall and the CPUSA criticized the Solidarity movement in Poland. In 1992, the Moscow daily Izvestia claimed that the CPUSA had received over $40 million in payments from the Soviet Union, contradicting Hall's long-standing claims of financial independence. The former KGB General Oleg Kalugin declared in his memoir that the KGB had Hall and the American Communist Party "under total control" and that he was known to be siphoning off "Moscow money" to set up his own horse-breeding farm. The writer and J. Edgar Hoover biographer Curt Gentry has noted that a similar story about Hall was planted in the media through the FBI's secret COINTELPRO campaign of disruption and disinformation against radical opposition groups. In the 1964 presidential election, Hall's party supported Lyndon B. Johnson, saying it was necessary to prevent the victory of the conservative Barry Goldwater. During the 1972 presidential election, the CPUSA withdrew its support from the Democratic party and nominated Hall as its candidate. Hall ran for president four times—in 1972, 1976, 1980, and 1984—the last two times with Angela Davis. Of the four elections, Hall received the largest number of votes in 1976, largely because of the Watergate scandal bringing protest votes for minor parties. But Hall ranked only in eighth place among the presidential candidates. Owing to the great expense of running, the difficulty in meeting the strenuous and different election law provisions in each state, and the difficulty in getting media coverage, the CPUSA decided to suspend running national campaigns while continuing to run candidates at the local level. While ceasing presidential campaigns, the CPUSA did not renew support for the Democratic party. In the late 1980s, when liberalization and democratization were under way in the Soviet Union and Eastern Europe, Hall maintained his Marxist–Leninist stance. Concerning Joseph Stalin, he admitted that even leaders of a socialist country might err sometimes but suggested that the Soviet historians were exaggerating Stalin's crimes. Hall declared that he had not become a member of the CP because of Stalin and would not leave because of him. The 1980s were a politically difficult decade for Hall and the CPUSA, as one of Hall's trusted confidants and the deputy head of the CPUSA, Morris Childs, was revealed in 1980 to be a longtime Federal Bureau of Investigation informant. Although Childs was taken into the United States Federal Witness Protection Program and received the Presidential Medal of Freedom in 1987, Hall continued to deny that Childs had been a spy. Also, Henry Winston, Hall's African-American deputy, died in 1986. The black party base questioned the fact that the leadership was exclusively white. After the dissolution of the Soviet Union in 1991, the party faced another crisis. In a press conference that year, Hall warned of witch hunts and McCarthyism in Russia, comparing that country unfavorably with North Korea. Hall led a faction of the party that stood against Glasnost and Perestroika and, for the hardliners of the CPSU, accused Mikhail Gorbachev and Boris Yeltsin of "demolishing" socialism. Hall supported Vietnam and Cuba but criticized the People's Republic of China for failing to oppose the West. In late 1991, members wanting reform founded the Committees of Correspondence for Democracy and Socialism, a group critical of the direction in which Hall was taking the party. When they were unable to influence the leadership, they left the party and Hall purged them from the membership, including such leaders as Angela Davis and Charlene Mitchell. During the last years of his life, Hall lived in Yonkers, New York, with his wife, Elizabeth. Along with following political events, Hall engaged in hobbies that included art collecting, organic gardening, and painting. In 2000, shortly before his death, Hall resigned the post of party chairman in favor of Sam Webb and was appointed honorary chairman. Gus Hall died on October 13, 2000, at Lenox Hill Hospital in Manhattan from diabetes complications. He was buried in the Forest Home Cemetery near Chicago. During his long political career as the general secretary of the CPUSA, Hall was criticized by nearly every part of the American political landscape. When the Socialist Workers Party (SWP) and its leaders in the Midwest Teamsters were prosecuted under the Smith Act in Minnesota in 1941, Hall supported the government actions. When the same act was used against Gus Hall in 1948, similarly putting Gus Hall on trial and imprisoning him for 5 and a half years for his Marxist ideology, the SWP took the principled position of siding with Gus Hall. Later, Hall admitted his support for the imprisonment of SWP members under the Smith Act was a mistake. In the early 1990s, disgruntled Communist Party members demanded more openness and democratization of the party. Soviet officials criticized Hall for poor leadership of the CPUSA. Young American Communists were advised to distance themselves from Hall and the CPUSA, as the party was seen lacking any capacity for revolutionary action. The CPUSA was under FBI surveillance and infiltration and thus had no potential. Many conservatives saw Hall as a threat to America, with J. Edgar Hoover describing him as "a powerful, deceitful, dangerous foe of Americanism". An inflammatory anti-Christian statement was falsely ascribed to Hall, earning him the hostility of some Christian groups, including Jerry Falwell's Moral Majority. In a 1977 speech, for example, then-future U.S. President Ronald Reagan planned to quote this alleged 1961 statement by Hall as proof of the evils of communism: "I dream of the hour when the last congressman is strangled to death on the guts of the last preacher--and since the Christians seem to love to sing about the blood, why not give them a little of it? Slit the throats of their children [and] draw them over the mourner's bench and the pulpit and allow them to drown in their own blood, and then see whether they enjoy singing those hymns." This statement—which Reagan ultimately excised from his speech because he claimed he did not have the "nerve" to say it—was supposedly read by Hall at the funeral oration of former CPUSA party chairman, William Z. Foster. Peace can be won!, report to the 15th Convention, Communist Party, U.S.A., New York: New Century Publishers, 1951. Our sights to the future: keynote report and concluding remarks at the 17th National Convention of the Communist Party, U.S.A., New York: New Century Publishers, 1960. Main Street to Wall Street: End the Cold War!, New York: New Century Publishers, 1962. Which way U.S.A. 1964? The communist view., New York: New Century Publishers, 1964. On course: the revolutionary process; report to the 19th National Convention of the Communist Party, U.S.A. by its general secretary, New York: New Outlook Publishers and Distributors, 1969. Ecology: Can We Survive Under Capitalism?, International Publishers, New York 1972. The energy rip-off: cause & cure, International Publishers, New York 1974, ISBN 0-7178-0421-6. The crisis of U.S. capitalism and the fight-back: report to the 21st convention of the Communist Party, U.S.A., New York: International Publishers, 1975. Labor up-front in the people's fight against the crisis: report to the 22nd convention of the Communist Party, USA, New York: International Publishers, 1979. Basics: For Peace, Democracy, and Social Progress, International Publishers, New York. 1980. Karl Marx: beacon for our times, International Publishers, New York 1983, ISBN 0-7178-0607-3. Fighting racism: selected writings, International Publishers, New York 1985, ISBN 0-7178-0634-0. Working class USA: the power and the movement, International Publishers, New York 1987, ISBN 0-7178-0660-X. ^ a b McHugh, Roy (May 5, 1978). "Marxist Gus Hall Recalls His Red Letter Days". The Pittsburgh Press. ^ a b c d e f g h i j k l m n Kostiainen, Auvo (September 2001). "Hall, Gus (1910–2000)" (in Finnish). The National Biography of Finland. Archived from the original on March 11, 2008. Retrieved April 27, 2010. ^ a b c d e f g h Matthews, Karen (October 17, 2000). "Gus Hall, American Communist Party boss, dies at 90". The Seattle Times. Associated Press. Retrieved October 25, 2007. Gus Hall, the American Communist Party boss who steadfastly stuck to his beliefs through years in prison and the collapse of communist regimes around the world, has died. He was 90. Mr. Hall died Friday at Lenox Hill Hospital in Manhattan of complications relating to diabetes, Scott Marshall, a Communist Party official, said yesterday. ^ a b c d e f g h i j k l m n o p Barkan, Elliot Robert (2001). Making it in America: A Sourcebook on Eminent Ethnic Americans. ABC-CLIO. p. 147. ISBN 1-57607-098-0. ^ Neil Betten (1970). "The Origins of Ethnic Radicalism in Northern Minnesota". International Migration Review. ^ a b "Gus Hall, U.S. communist chief, dies". Herald Tribune. October 17, 2000. p. 8A. ^ a b c d e f g h i j k l m n Tanenhaus, Sam (October 17, 2000). "Gus Hall, Unreconstructed American Communist of 7 Decades, Dies at 90". The New York Times. Retrieved July 4, 2008. Gus Hall, the zealous lifelong Communist who led the American branch of the party from the cold war through political oblivion in the post-Soviet era, died on Friday at Lenox Hill Hospital in Manhattan. He was 90 and lived in Yonkers. ^ a b c d Maurice Isserman, Dorothy Ray Healey (1993). California Red: a life in the American Communist Party. University of Illinois Press. pp. 172–174. ISBN 0-252-06278-7. ^ Hans A. Linde (1966). "Campus Law: Berkeley Viewed from Eugene". California Law Review. ^ Busky, Donald F. (2002). Communism in history and theory: Asia, Africa, and the Americas. Greenwood Publishing Group. p. 167. ISBN 0-275-97733-1. ^ a b Klehr, Harvey (1988). Far Left of Center: The American Radical Left Today. Transaction Publishers. pp. 23–25. ISBN 0-88738-875-2. ^ Pflüger, Friedbert (1983). Die Menschenrechtspolitik der USA. Oldenbourg. p. 155. ISBN 3-486-51901-8. ^ Oleg Kalugin, The First Directorate (New York, 1994), pp.55–56. ^ Gentry, Curt (1991). J. Edgar Hoover: The Man and the Secrets. New York: W.W. Norton & Company. p. 443. ISBN 0-393-32128-2. ^ Uwe Schmitt (April 29, 2004). "Das ist Mum, sie arbeitet für die Kommunistische Partei". Welt. ^ Barron, John (1997). Operation Solo: The FBI's Man in the Kremlin. Regnery Publishing. p. 4. ISBN 0-89526-429-3. ^ "Gus Hall". The Economist. October 26, 2000. ^ "Ohne Kopf und Kapital". Die Zeit. January 3, 1992. ^ Horne, Gerald (1993). Black liberation/red scare. University of Delaware Press. p. 213. ISBN 0-87413-472-2. ^ a b c Kalugin, Oleg (1994). The First Directorate. St. Martin's Press. p. 56. ISBN 0-312-11426-5. ^ John H. George, Paul F. Boller (1989). They never said it. Oxford University Press. p. 44. ISBN 0-19-505541-1. ^ Kiron K. Skinner, Martin Anderson, Annelise Anderson, eds., Reagan, In His Own Hand (New York, 2002), 34; David C. Wills, The First War on Terrorism: Counter-Terrorism Policy During the Reagan Administration (Lanham, MD, 2003), 22. Wikimedia Commons has media related to Gus Hall. Joseph Brandt (ed. ), Gus Hall: Bibliography New York: New Century Publishers, 1981. Fiona Hamilton, "Gus Hall", The Times, Oct. 18, 2000.